The WTG86402GB from Bosch is a fantastic option for a busy home, as it offers brilliant drying performace combined with handy options such as Anti Crease - who wouldn't want to spend less time at the ironing board! Fully utilising the Sensitive Drying system by Bosch, it gently pushes warm, mild air over the load while turning using curved, soft carriers. Perfect for delicate items. 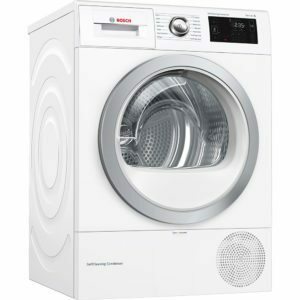 With Anti-Vibration sidewalls noise is minimised and the Auto Dry sensors detect moisture and ensure that the dryer does not run unnecessarily. Great for saving pennies! 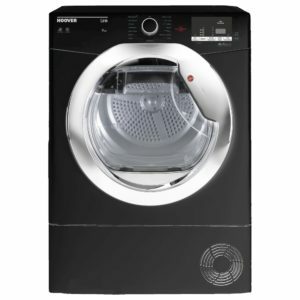 This black Hoover tumble dryer has an impressive 9kg capacity and is B rated for energy efficiency. This unit can be placed anywhere in your home as it has a condensing unit which eliminates the need for a vent hose. The machine converts the steam back to water and you simply empty the water container when required. 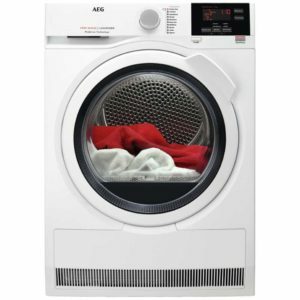 Using the Absolute Care system, this fantastic 9kg dryer from AEG makes sure your clothes are kept in brilliant condition by actively monitoring the drum movement and temperature so different loads are treated in the best way for brilliant results. 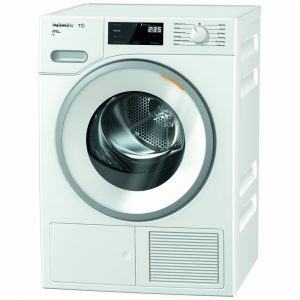 ProSense technology inside the T8DEC946S adjusts the run time as it senses the load, so there's no overdrying and SensiDry removes moisture at a lower temperature. This means supreme care of your clothes in every cycle! £100 Cashback With This Model! 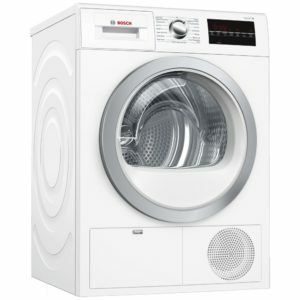 This superb dryer from Miele will take care of your clothes, offering a range of programmes for everything. Thanks to their honeycomb drum and sensor drying system, items are gently dried, and with the handy pre-ironing function, there's less time spent at the ironing board. There's the added bonus of the Fragrance Dos system, which automatically doses specially made fragrance capsules into your laundry for long lasting freshness. This model is hugely efficient with an A+++ energy rating, perfect for your pocket! 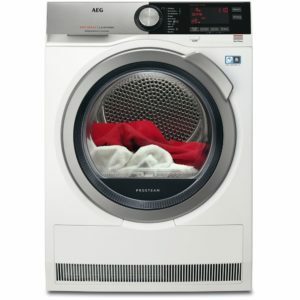 AEG take care of your clothes with this fantastic condensor dryer. With a handy 7kg capacity, there's plenty of room but featuring a Pro Tex drum, which is gentle on your clothes, you can be sure of great results. Offering 7 programmes, everything from cottons to delicates are catered for, and as this model is a condensor dryer, water accumulates in a drawer for disposal, which means easy installation anywhere inside the house. 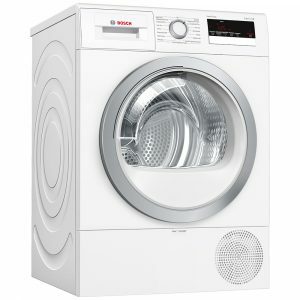 This superb white heat pump condenser tumble dryer from Bosch has an impressive 9kg capacity and is A++ rated for energy efficiency thanks to its heat pump condenser. This recycles heat using Active Air technology, keeping running costs low even when the cycles are longer. The self cleaning condenser and easy to use Direct Select controls make maintenance and use a breeze. With Bosch's Sensitive Drying system, which uses mild warm air and gentle turning, clothes are taken care of and without creases as they aren't flattened. All kept quiet with anti vibration side walls, great for the busy home! 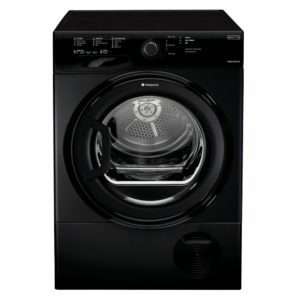 This Hotpoint freestanding tumble dryer comes in a stylish black finish to complement any setting and features a large 8kg drum capacity. It is designed to protect your garments and features some of Hotpoint's newest care technology. Features include the Fibre Care option, which has been specially designed for delicate clothes and, with the press of a button, automatically adjusts settings so that the lowest temperature is being used for a longer duration to ensure a thorough but gentle dry, and Anti-Tangle technology, which uses a reverse tumble action to ensure that your clothes dry evenly and without tangling together to keep them looking better for longer. This appliance also includes a large capacity water bottle, which means you can get through more loads without emptying it. 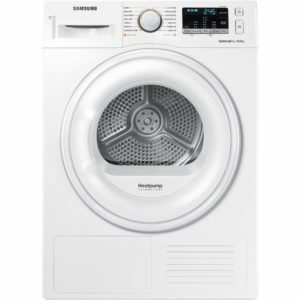 This fantastic 9kg heat pump condenser dryer from Samsung is the ideal option for a busy household. Featuring OptimalDry Smart technology, it uses moisture and temperature sensors to adjust the drying time for the best results, protecting your clothes from damage, whilst saving energy. This is available on 10 drying programs. Also, with AirWash technology, deodorise and refresh your clothing simply by using hot air. This function is ideal for one or two garments at a time. Perfect for those last-minute plans, meaning a refresh of your favourite outfit! Plus, you can now easily check whether your condenser water tank needs emptying thanks to a visible water level indicator on the dispenser drawer. Nice and handy! This superb dryer is finished in graphite and has an A+++ energy rating, making it ideal for a family. 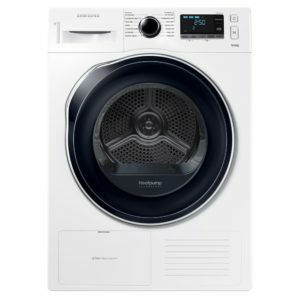 With an A++ energy efficiency rating and useful 8kg capacity, this heat pump condenser dryer by Samsung is ideal for any home. As it does not need venting to the outside it is easy to install a condenser dryer inside.The DV80M50101W uses heat pump technology to recycle heat, and condenses moisture from the load into a drawer. You can tell at a glance when it is time to empty the drawer or clean the filter with the handy indicators. With a range of programmes including wools, shirts and synthetics, you can be assured that there is an option for every load. £75 Cashback With This Model! 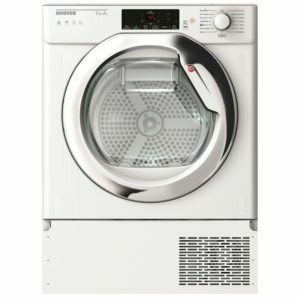 Taking care of your laundry, this Miele tumble dryer will offer the fantastic performance we expect from Miele. Offering a 7kg capacity, you can pick the perfect drying programme, whether you need it for Cottons or Delicates. Thanks to the Perfect Dry system, your clothes won't be overdried, as sensors detect the moisture and adjust the run time as needed. Miele's innovative designs continue, with the Fragrance Dos system that dispenses long lasting fragrance capsules, designed specifically for Miele, so you get beautiful smelling laundry. All of this and an A++ energy rating, so you can be assured running costs will be nice and low. 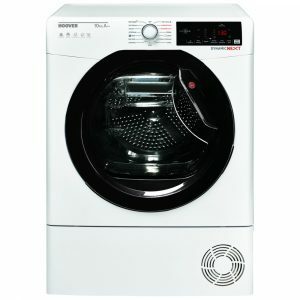 This white Hoover heat pump condenser dryer has an impressive 10kg capacity and is A++ rated for energy efficiency. This unit can be placed anywhere in your home as it has a condensing unit which eliminates the need for a vent hose. The machine converts the steam back to water and you simply empty the water container when required. 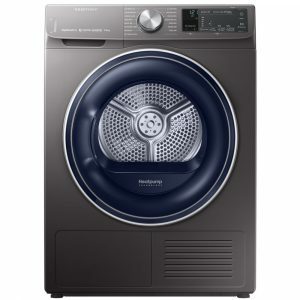 Our range of tumble dryers has got some of the best available on the market, including top brands like Hotpoint, Siemens and LG. 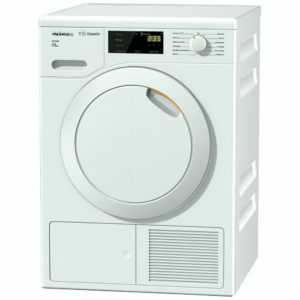 Check out our entire range of laundry appliances here. 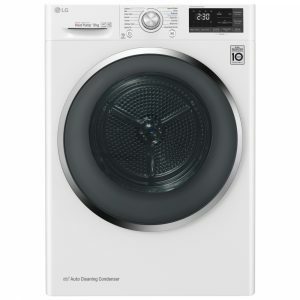 We have ranges of washing machines and washer dryers as well as the tumble dryers above. With cooking, refrigeration and extraction appliances available on our website too, you can kit out the whole house for a great price at Appliance City! Simple instructions for installing both condenser and vented tumble dryers. And keep it in optimum condition. Condenser vs Vented Tumble Dryers: What’s the Difference? And which is the right choice for your home?